Sam was recently promoted to Senior Consultant within the Key Accounts Contract team and currently holds the title of Rookie of the Year. His career in recruitment had a smooth start, but that does not mean it was always easy. Have a look at Sam’s journey! I studied sports at college and gained additional qualifications to become a football coach. I have always been very academic and passionate, and I was very proud of excelling. After school I got a job at a good local football club where I was teaching children different sports. The structure in the company was very hierarchical with lots of people at the bottom layer and no real progression opportunities. I decided to move to another company that manages different football leagues, where I now also had to coordinate kid’s parties. The working hours were not ideal and again, there were no progression opportunities. One of my customers saw that I had potential and was determined to help me find the right job for me, so one day he sent me a message with the Whitehall phone number. I called and spoke to HR, we spoke about the role and my background, and after a successful interview I joined the Key Accounts team. I only had a basic idea of recruitment at the time, but I knew what I wanted to achieve out of it. The first weeks were tough, because I hadn’t appreciated how much I would need to be on the phone, but I was persistent because I wanted to do something for myself. Within a couple months and still within my probation period, I made my first deal and also brought in my first new customer. Within six months I was hitting all my targets, and only nine months after I started I win one of the company quarterly awards which saw me heading to Portugal for a weekend! Later in the year I hit my first billing target which was a pay rise alongside the commission I earn. At this point, my manager started to work together with me to look at my competencies to become a Senior Consultant and took on other clients. 14 months after I started, I was promoted to Senior Consultant. I currently hold the title of Rookie of the Year, which I won in our annual employee awards. I asked at the time why I won because I really wasn’t expecting it, especially as there were other strong colleagues in the same category. I was very pleased to hear that it was in recognition for my hard work and the rarely-heard-of achievements: 25 deals in 12 months, 5 deals in one single month. Part of the prize is that I won another trip to Portugal, which I’ll be doing in a few weeks’ time. I am really looking forward to it. I believe one of the main reasons I did so well is because how the expectations were managed. When I came to the job interview I asked where I would be in three years’ time, they said I would probably be a Senior Consultant. I managed to do it in 14 months only which I am very proud of. I must say that being surrounded by experts had a big impact in my success. Between the Team Leader, Manager and Sales Director who I used to sit next to, I had over 20 years of recruitment experience to guide me and provide feedback. The way the business is structured also helps, especially when you are new in the business, because it means you don’t need to a ask manager to answer your questions, you can ask a senior consultant or a team leader and you can trust their knowledge. There is also a lot of support available to get to the each next step. From team leaders to managers to the Learning and Development team (L&D). I had a difficult couple of months where I was struggling to place candidates, but following a few sessions with the L&D team where we reviewed what I was doing and the stats, I took a step back, got advice from a different angle and I was back to doing deals! Sometimes you just need to be persistent. It is fast paced, so the days go by quickly. You place one role and you get onto the next one. You know that the more roles, the more work, more placements, more commission. The better I can serve Whitehall’s candidates and clients, the better I do. As a Senior Consultant I am currently still finding the balance between placing candidates and my new responsibilities that include making sure interviews are planned correctly and assisting others, plus I am working on my own development. My team is fantastic. Doesn’t matter what your background is, your experience or if you have been in the role a day or a year, you get the same respect. Everyone was welcoming and helpful from day one. They are people who are in the same boat as you and you can share your frustrations, laugh and joke with. We have a very nice group of people working together across the whole company. I also like that I can see a clear path of progression. In my other jobs I couldn’t see where I was going with it, if I did a good job, all I got was a pat on the back. Here there are clear targets and I know what I get when I hit each of my goals. I know that if I succeed I am going to benefit directly from my success. I like being part of a company that is growing at such speed. I am proud of the awards we’ve won such as Best Companies to Work For and I also like the incentives, milestone rewards (we will be having celebration food this week for achieving 55th in the International Track 200). You get rewarded for your hard work and that is something I was not getting in my previous jobs. As I am now a Senior Consultant, the next step is to complete the first level of the Leadership program, so I can start hiring people to work in my team. I also need to make sure my current contracts are running smoothly to ensure I’ll have full capacity to train and support my new team. 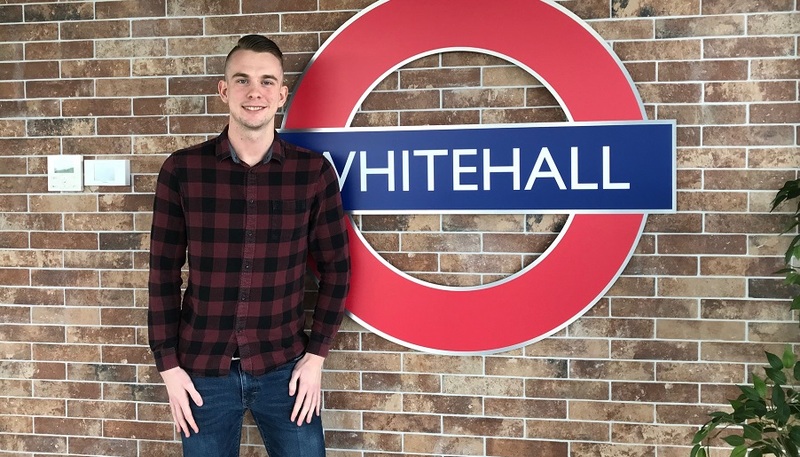 There are two routes you can take in the recruitment carrier at Whitehall, and I would like to go into the Team Lead and Management direction, I enjoy having responsibilities and being able to provide support to other team members. What would you tell people who is considering joining Whitehall? Just do it. If you want clear direction and you want to progress and get back what you put in, this is a company that cares about you and can support your ambitions – especially if you are feeling undervalued in your current job. Whitehall has the capacity and ability to give you that opportunity for progression, as well as the leadership and mentorship you need. You really need to see it for yourself. Get your foot into the door, start meeting the people and understand the job and the values that Whitehall has to offer. It is a fantastic place to work. We work hard to be the best in our field and our clients and candidates recognise that. We are also based in Colchester so forget about long hours and commuting to London!